The Power Behind the Mind contains guidance of great value to those on the path of inner discovery. The highest truth cannot be put into words, it can at best be indicated. So the teachings provide us with material to reflect upon which helps us to see more. And the practices, when we do them in the right way, develop the inner qualities that allow more light to shine through. Our habitual ways of thinking and feeling are thus challenged, and at this stage we need an illumined guide, one who knows both the complexities of the human mind, and the sublime reality underlying it. Marjorie Waterhouse is a guide with exceptional expertise, insight and compassion. She was one of the closest pupils of Hari Prasad Shastri, and after his passing became the second Warden of Shanti Sadan, the traditional teaching school of non-duality he established. Her writings help us to follow the non dual teachings as they apply to us personally in our own particular circumstances and lead us on towards the goal of complete inner freedom. Her writings are infused with good humour and human kindness. 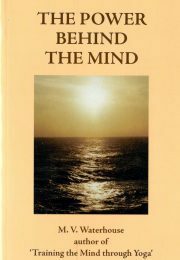 The Power Behind the Mind is one of three books by her. The others are Training the Mind through Yoga, and What Yoga Has to Offer. These books are ideal reading if we have started to seriously reflect on the teachings and to do meditation and related practices with interest. They will help to make sure that the challenges on the path are taken not as obstacles but opportunities to penetrate the mental clouds and open up our inner vision to the non-dual reality abiding in the heart of all.